One way to answer the question is to compare Britain’s woman suffrage movement with Alice Paul’s strategy in the United States. “Suffragette,” a British film now in U.S. theaters, tells a gripping story drawn from the direct action wing of Britain’s woman suffrage movement. Because it spotlights one tactic – property destruction – the film raises the question of effectiveness. Leader Emmeline Pankhurst’s argument for escalating with arson and explosions was to hasten their win. Did it? One way to answer the question is to compare the struggle with Alice Paul’s strategy on this side of the ocean. Paul also escalated with nonviolent tactics but chose to rule out property destruction. The fact that Alice Paul cut her teeth in the British movement, and then in this country made a different strategic choice, provokes some thinking about a tactic that some U.S. activists look upon with favor. When I lived in Britain, I talked with women who participated in their movement, and back home I researched what American women did. I conducted a long interview with Paul, who was arrested repeatedly in Britain before returning to the United States to organize a direct action wing of the American movement. The time was right. By 1908, the WSPU mobilized 60,000 people for a nonviolent invasion of the House of Parliament. A reinforced police line held them back. That same year, the American Alice Paul was studying at a Quaker college in Birmingham, England. She plunged into the WSPU. Beaten by police, her seven arrests led to three imprisonments. The WSPU began its most controversial escalation by smashing windows and a wall of the House of Parliament. After Parliament failed to extend suffrage in 1910, the WSPU channeled anger and disappointment by blowing up governmental postal boxes and starting fires in the houses of Members of Parliament. Pankhurst expected the resulting polarization of opinion, but thought it would pay off by increasing the government’s sense of crisis. Alice Paul and Lucy Burns returned to the United States in 1910. The large National American Woman Suffrage Association, or NAWSA, confined itself to lobbying and petitioning. Its strategy of winning suffrage state-by-state seemed to Paul to be moving at a glacial pace. In every campaign, the choice of target is critical. Paul used her graduate study at Penn to think through a shift in target: from states to the federal government. In the meantime she worked in Philadelphia’s woman suffrage scene and got women to stand on a box on the sidewalk to address startled pedestrians. In this Internet-soaked period, it is tempting for activists in one country to copy-cat actions that are gaining publicity elsewhere, without asking how conditions in their own city or country are similar and different to the place in the spotlight. That happened with Occupy Wall Street, for example, taking the occupation in Cairo’s Tahrir Square as something to emulate, then finding that the rigidity of the basic form (“Hold the space!”) prevented the flexibility that a successful movement needs to grow organically under quite different conditions. Alice Paul, nurtured in the advanced direct action of the British suffragettes, could have tried immediately to organize a civil disobedience campaign on this side of the Atlantic. Instead, she sniffed the air, built relationships, developed credibility within the U.S. suffrage movement, and then chose a moment to test the political climate. With the support of NAWSA, Paul organized a Woman’s Suffrage Parade in Washington in January 1913 — the day before Woodrow Wilson’s presidential inauguration. You can watch a version of the near-riot that resulted in the excellent HBO movie “Iron Jawed Angels,” starring Hilary Swank as Alice Paul. Except for a made-up love interest for Alice Paul, the film follows the narrative of the campaign in a remarkably accurate way. The thousands of women marching that day and the abuse they endured brought into the spotlight their demand for a suffrage amendment to the U.S. Constitution. Alice Paul and Lucy Burns concluded that the country was ready for a direct action campaign targeting President Wilson and the Democratic majority in Congress. Their gradual but edgy tactics in this direction led to a split with NAWSA and starting the National Woman’s Party. By December 1916, they had a full-fledged direct action campaign. Like their sisters in the United Kingdom, they disrupted (including a banner-hanging in the U.S. Senate) and picketed (the first group to picket the White House). Civil disobedience was central: By the time of their victory Julia Emory had been arrested 34 times. They used the tactic of jail-in: When the police began to arrest them, they recruited more women to picket and refuse to pay fines, in that way taxing the limited jail facilities. They often refused to work and went on hunger strikes. Emmeline Pankhurst suspended the WSPU’s campaign in 1914 when Britain entered World War I. When in 1917 the United States entered, U.S. groups were pressured to support the war effort, but Alice Paul refused. Instead, she escalated, challenging Woodrow Wilson to become as enthusiastic about democracy at home as he was in his pro-war rhetoric. In front of the White House, women held signs calling their president the title of the enemy Germany’s emperor: “Kaiser Wilson!” When infuriated men beat up the women, the police looked the other way. Police reportedly arrested some men who intervened to try to protect the women from the punching and kicking attackers. 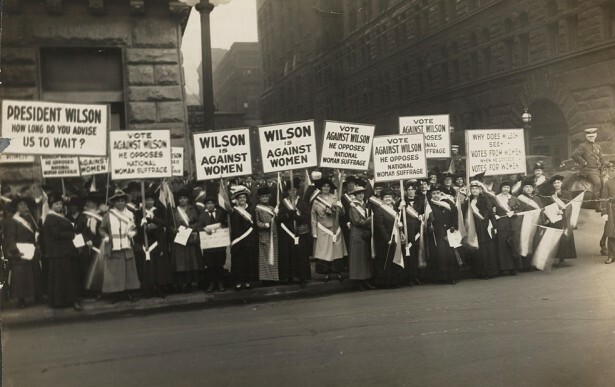 While some members of the Woman’s Party resigned to protest Paul’s lack of patriotism, other women joined the campaign, angered by Wilson’s hypocrisy. They publicly burned the president’s speeches whenever he invoked “the American obligation to stand up for democracy.” Jail sentences became longer. Wilson felt the pressure. He’d already gone from dismissing the idea of a suffrage amendment to agreeing in principle — although, he said he needed to wait until the end of the war to attend to the matter. To add pressure, some women released from jail were sent on speaking tours around the country, sharing their experience of repression. Opinion shifted; prominent politician Dudley Field Malone, for example, announced his resignation as Collector of Customs for New York in protest against the treatment of the picketers. Finally, the president relented and, even though the war continued, urged Congress to pass the amendment. Congress did so, and after a massive push by the movement, including the NAWSA, enough states ratified the amendment to bring victory in 1920. The Woman’s Party relied on a strategy of escalation just as much as WSPU. Each knew that society would initially polarize, with some allies and even members distancing themselves from the cause in the short run. (Much later in the United States, we saw during the civil rights movement this dynamic again: first polarization, then growth of support for the campaigners.) Significantly, Alice Paul even when intensifying the escalation in 1917, used nonviolent tactics instead of property destruction. The Woman’s Party ended its direct action when Congress passed the amendment in 1919. From start to finish, the direct actionists in the United States campaigned for six years. The WSPU had the advantage of larger numbers of women ready to do direct action. Halfway through their campaign they were able to assemble 60,000 women to try to invade Parliament, a larger number than the entire Woman’s Party membership grew to be across the United States. That’s quite remarkable when you consider how much smaller Britain is as a country. Furthermore, it has a unitary government and no written constitution needing amendment. The WSPU campaign started in 1903 and ended in 1914 – 11 years in duration, five years more than that of the Woman’s Party. When Parliament finally responded in 1918, only 40 percent of women gained the right to vote: those over 30 with property. Not until 1928 did the United Kingdom make women equal with men as voters, something gained in the United States in 1920. When we look at escalation, whose goal is to accelerate victory, the comparison is even more stark. The Woman’s Party’s nonviolent direct action intensified in the final two years and led to victory. Before suspending the campaign, the WSPU used property destruction for its final six years. It’s hard to disagree with the British historians who believe that WSPU’s use of property destruction was sadly self-defeating. In the United Kingdom and the United States, I don’t expect a shift in the emotionally-laden meaning of property destruction to happen any time soon. In the meantime, let’s join Alice Paul, who knew that escalatory nonviolent tactics resulting in suffering often cause polarization initially, but then lead to the paradox of repression. That’s when the Dudley Field Malones join the cause because they correctly see who is perpetrating violence. What slowed down the Brits, despite the moving heroism shown in “Suffragette,” was that they didn’t understand then what we can all see now: Choose nonviolent tactics for escalation if you want to ensure a greater chance of victory. This is a simplistic history (just look at the boiling down of the Occupy movement as being inspired by one thing) that fails to recognize successful resistance/social movements employ a variety of tactics. It is not a matter of either/or, more like both/and/and …. Agree with Michael. I found much in here that I wasn’t aware of, including more detail on the US struggle for women’s suffrage, which I didn’t know much about. But on the whole this is a simplistic account which looks more as if it sets out to confirm the already established views of the author on non-violence. Don’t you think the differing views of Emmeline Pankhurst and Alice Paul on how the movement should relate to the war might have had something more substantial to do with their relative success? Pankhurst resisted working class women’s participation in the WSPU and quickly ceased the struggle to allow for the bloodbath of WWI. It sounds like Paul took a different tack – maybe that has had more to do with it? Let’s not forget that millions of women on both sides of the Atlantic fought, in nonviolent campaigns for suffrage and other rights for at least 70 years, in one of the longest and largest movements for civil rights. The WSPU and the National Woman’s Party campaigns are only the most dramatic, publicized, and recounted/remembered of the thousands of campaigns that women fought. The final legislative changes allowing for full suffrage rights for women would not have happened without the broad support and hard work of women (and male supporters), all over Great Britain and the US. Single women taxpayers in the UK could vote in municipal elections beginning in 1869, and could be elected to local county and borough councils after 1907. By 1917 millions of women in the US had some municipal voting rights, and in about a dozen states had full suffrage and electoral rights. Suffragette is a beautiful film, grim, but beautiful, and worth seeing. There are some tremendous and memorable scenes, but I found it to be a bit obscure unless one knew something about the British movement and the WSPU beforehand. We all need to know more about the history of the movements for women’s rights, and this film should just be a beginning. Please get the dvd “Hit and Stay” re the draft board raids- also chk Plowshares actions. The draft actions, Media Pa, where files were destoyed, etc were clearly effective. Lives were saved. “Some property has no right to exist”- eco “terrorism. monkey wrenching- I endorse it. Did Norman Morrison destroy property? Let’s talk abt the shades of grey. I support Dorothy Day and am a member of the Catholic Left- but I am not a strict pacifist. I am an existentialist. Great article on why keep the strategy and tactics nonviolent with no violence to people or property. Lets learn from history. good issues, interesting critique. Judging yesterday reminds me how little we know. I thought this film provided a story worth watching. very interesting – thank you, I have been sending this around to friends of mine who have been or are planning to see Suffragette. Important discussion for strategic planning for our campaigns today. Just a typo re the date in paragraph 5 of the Alice Paul section – you mean 1913, not 2013. The movie is excellent. And this article does a good job in making the case that tactic used then and there would not necessarily be helpful either then and another place or here and now. What is needed when we look at or study other groups working for democracy and justice is to distinguish between strategy and tactics. Strategies are the intermediate goals one must accomplish in order to succeed in their mission. Tactics are the actions used to achieve those goals. Here, we could use the same strategies set by other movements, even like the Suffragette movement in England, without immitating the tactics. Some of those strategic goals would include gaining press attention, gaining popular support and sympathy for the marginalized, and being able to pressure the gov’t. The tactics we choose should fit what we know about our audience as well as our own morals rather than the tactics used by other groups from other places and/or other times. It is the failure to develope of new tactics that has hurt the causse of leftist activist groups today. I appreciate the thoughtfulness of the comments and will respond to some of them here. Overall, the comments reveal how astute Gandhi was when he advocated conflict: he believed that debate and dialogue assists people to understand things on a deeper and more complicated level and get closer to the truth, which is by definition very complex. So someone reading the comments to this article can come away with a more nuanced understanding about what is at stake in strategy and tactics for our own movements today. I agree with Michael and George and Wendy that my 1500 words present a simplistic picture. So much is left out – as Wendy says, the masses of women and men who struggled for decades in less dramatic ways to achieve suffrage, and gained significant victories along the way. Every choice to spotlight part of a movement leaves out the rest, and “the rest” includes all of us unsung heroes without whom the movement would not succeed. As Michael says, the Occupy movement was many things, and its origins and reach can’t be caught in a phrase. On the other hand, when any of us choose to highlight one (or even three) aspects of a movement, our failure to write about everything else doesn’t invalidate the point we’re making about the thing we’re focusing on. So George’s question about the role of choosing to support World War I or not is relevant to the outcome, I agree. A victory is probably never determined by only one strategic choice; many choices play a role. I, however, was spotlighting the answer to the question of that day (and still a question for today): does property destruction as a means of escalation accelerate victory? This leads me to David Eberhardt’s reference to draft board raids, Plowshares actions, monkey wrenching. What makes it so hard to make pragmatic judgments about the effectiveness of those is when they happen outside the context of a campaign. Campaigns, like the suffrage movement, have a specific goal and a specific target/opponent. They win, or they don’t, or they achieve a partial victory. The Global Nonviolent Action Database has over 1000 campaigns from almost 200 countries, with each campaign given a score, from 0 to 10, on the degree to which the campaign succeeded. Doing actions within a campaign gives us a chance to evaluate our success and build a learning curve. Doing actions as a kind of witness in a formless movement provides little chance to learn and develop a craft. I’ve been in endless discussions about the efficacy of the draft board raids and found them impossible to evaluate. I know that the FBI decided they threw the movement for a loss, and in at least one case (the Camden 28) planted someone within the group to make sure the group went through with its plan at moments when the group was hesitating. Maybe the FBI was right – the draft board raids undermined the movement against the Vietnam war. How can we begin to figure that out, without a campaign with specific objectives to support evaluation? Our time’s radicals who choose property destruction do, indeed, split the movement (as Alice Paul and SNCC and Dr. King did) but don’t take advantage of the paradox of repression, and the broader movement doesn’t rally around them. As far as I know, they simply don’t understand the dynamics of that strategic choice. James also raises the definitional questions of “violence” and “property destruction,” and I respond to that under the button “About” on the home page of the Global Nonviolent Action Database. Note that Gene Sharp includes property destruction in his list of 198 methods of nonviolent action, but it is a very particular kind. You’ll find that also on the website of the Global Nonviolent Action Database. My difference with my good friend David Hartsough is also definitional: I don’t consider property destruction “violence” except when the property is embedded with humanness, for example if someone slashes a painting that the artist has lavished attention on. To me, the problem with destroying draft files and tanks is not that it is “violence” but that is most likely strategically wrong-headed. It therefore needs to be justified, for me, pragmatically, and in my history in the movement I keep running into property destruction advocates with assumptions, morality statements, and emotional impulses instead of thoughtful strategic arguments. I’m grateful to Marco for raising the “fear factor.” Watching the French government respond like a Pavlovian dog to the horrible terrorist attack in Paris, which reminds me of the U.S. government’s reaction to 9/11, should be ample reminder that most people do not think well when they are scared. Even during the overwhelmingly nonviolent civil rights movement in the U.S., membership rose in the NRA. Expect, then, that bold action will scare people. Explicit and dramatized nonviolent action will often keep that fear in check sufficiently so one can win victories through smart campaigns, even if the campaigners’s color is read as itself scary. Escalation through property destruction unleashes fear and invites defeat by a government that knows how to manipulate the fear of its constituents. Thank you, Marco. If some of our readers don’t understand this dynamic, they should try entering a friend’s house, expressing a point of view loudly, then throwing chairs and breaking windows to underline their point. Please report in. Sorry, friend Lyn, for the typo, and glad you’re furthering the discussion as you have for so many years. And thanks for Curt’s vote for creative tactics and WagingNonviolence’s dedication to passing along descriptions of tactics in today’s movements!